Sydney Rd is Melbourne’s equivalent of the desk draw marked ‘Misc’. It has two things in abundance (bridal gowns and kebabs), but there’s also a killer range of op-shops, second hand stores, weird boutiques and independent retailers, clogging the high street between Brunswick Rd and Bell St.
You could spend a happy Saturday just wandering up and down Sydney Rd, but we jumped on a new Made In Melbourne tour from Urban Adventures instead (you always find a few hidden gems on these things). Grab your pineapples—we’re going op-shopping. 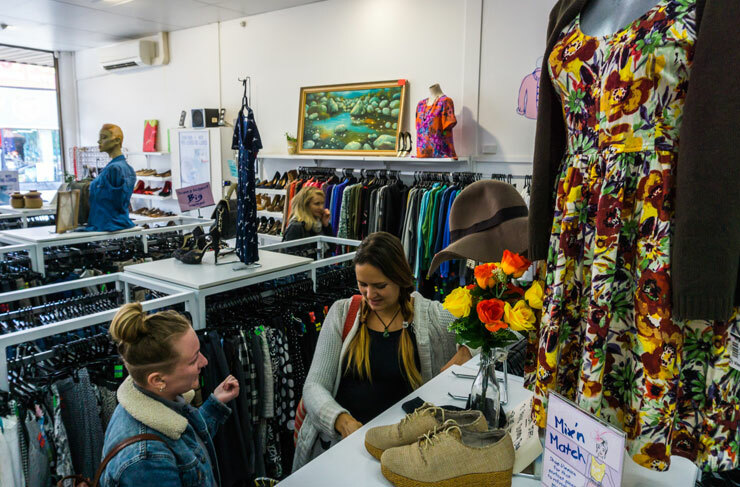 Recycle Boutique isn’t an op-shop per say. It’s a consignment store. There’s a difference. For one thing, Recycle Boutique only accepts high quality, independent labels (no rips, tears or smells, and no H&M). You can donate your stuff and get 50% of the value in store credit. It’s like the Circle of Life for clothes. And the range of Hunter S Thompson Hawaiian shirts on the rack was genuinely impressive. The beginning and end of every Melbourne costume party. But Savers is also a great spot to dig for second-hand books, hand-me-down jackets for winter, house appliances and old-school furniture. The prices are always amazing, and there’s even a helpful guide to thrift shopping on their website. Keep an eye out for the members-only 50% off super saver days. This place is like Gorman, if Gorman were a tiny independent boutique dedicated to funky patterns and sustainable fashion. New Model Beauty Queen (or NMBQ for short) is run by Dale and Sharmaine Cornell, who work in the rag trade and print their own designed from a Saxon St printing house (just ‘round the corner). They often use ‘cabbage’ (industry rejects) to upcycle eye-catching clothes for men, women and kids. Check out their screen printing process here. One of our favourite vintage shops on the strip. Melbourne Vintage has a real Cave of Wonders vibe to it—you never know if today’s search is gonna unearth a rare Paul Simon cassette, a fur coat (at 20% retail price) or a sweet pair of canary yellow Cobain sunnies. 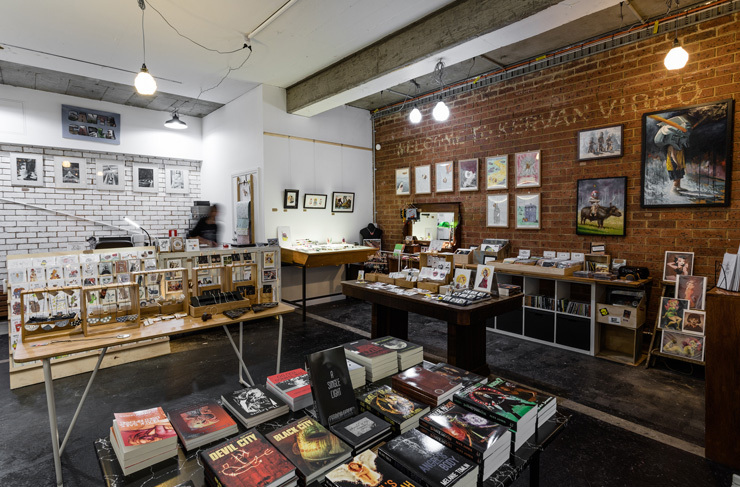 Throw in dog-eared paperbacks, a rotating record collection, bags, hats, pins, patches and even boutique swimwear—you’ll need at least 45mins to browse properly. Ah, the classics. There’s a reason people keep going back to Vinnies and The Salvos, and it’s not just the prices. A constant stream of local donations mean the stock in here is rotating all the time (very helpful when you’re moving house and need cutlery and crockery, just FYI). You’ll find Vinnies at 107 Sydney Rd, just near Jewell Station. The Salvation Army is further up, past Albion St.
You need to leave Sydney Rd for this one, but it’s worth it. Swing a left down Victoria St and you’ll find Squishface about 100m down—a tiny little shop, with zines and comics stacked in the window. It’s basically a co-working space for artists. Award-winning artist Ben Hutchinson runs the place, pumping out amazing cartoons on a giant central table. You can come in and browse, pick up a local comic or two, get some tips on your drawings, or sit down and have a scribble. Pro tip? Pick up a copy of Ben’s latest masterpiece: The Invisible War. A-MAZE-ING. 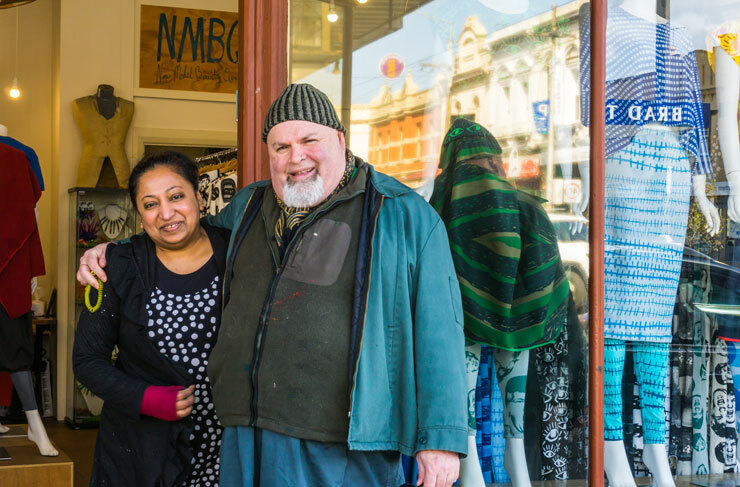 “A lot of people ask me what we do here,” says Jode, the owner of Santa Carla, “We stock a diverse range of work from independent emerging artists, representing many forms—original pieces, jewellery, books, comics, prints, plushies, music, giftwares, homewares, stationery and accessories." Part jewellery store, part comic books, part local artwork, part kids toys. Santa Carla basically stocks anything that tickles Jode’s fancy. Each month she handpicks some of her favourite Melbourne artists, designers, makers and creators, then showcases their stuff in Sparta Place. Trust us—you can’t walk past without popping your head inside. Another Sparta Place gem (you might notice it on your way to Long Story Short). Arbor is a boutique jewellery shop, stocking some seriously interesting stuff. Owner Elli includes a little artist bio with every purchase, so you get a bit of the story behind the piece. Make sure you check out the new work by local Brunswick artist Amanda Croatto. She uses thin slivers of anodized titanium to create dreamy technicolour earrings. See what we mean? Interesting stuff. Tiffany’s, this place is NOT. Most Northsiders are well acquainted with this age-old Brunswick institution, but Southsiders, we’re here to tell you that Dejour is worth the trek. The small shopfront sandwiched between bridal stores doesn’t look like much from the outside, but inside, it's pumping with endless piles of jeans of every size, colour and design, stacked on floor-to-ceiling shelves, lively shop assistants ready to help out and a bustling alterations service at the back. Free alterations and tailored jeans for around $55? There’s nowhere else like it in Melbourne. (Pro tip: come early on weekends, it’s crazy busy by 11am).